Supply and demand is one of the most basic and fundamental concepts of economics and of a market economy. The relationship between supply and demand results in many decisions such as the price of an item and how many will be produced in order to allocate resources in the most cost-effective and efficient way. Supply refers to the amount of goods that are available. Demand refers to how many people want those goods. When supply of a product goes up, the price of a product goes down and demand for the product can rise because it costs loss. At some point, too much of a demand for the product will cause the supply to diminish. As a result, prices will rise. The product will then become too expensive, demand will go down at that price and the price will fall. Supply and demand should reach an equilibrium. The amount of goods being supplied is the same as the amount demanded and resources are allocated efficiently. 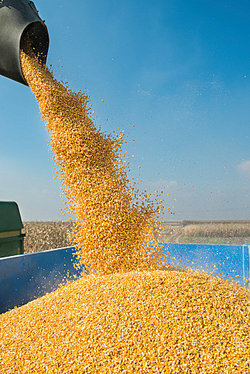 Corn crops are very plentiful over the course of the year and there is more corn than people would normally buy. To get rid of the excess supply, farmers need to lower the price of corn and thus the price is driven down for everyone. There is a drought and very few strawberries are available. More people want the strawberries than there are berries available. The price of strawberries increases dramatically. A huge wave of new, unskilled workers come to a city and all of the workers are willing to take jobs at low wages. Because there are more workers than there are available jobs, the excess supply of workers drives wages downward. A popular artist dies and, thus, he obviously will be producing no more art. Demand for his art increases substantially as people want to purchase the few pieces that exist. A cultural fad item that was all-the-rage for a period of time falls out of favor and is no longer "cool." Demand for the item falls dramatically as it is no longer the must-have item of the season. A new restaurant opens up in town and gets great reviews. There are only 12 tables in the restaurant but everyone wants to get a reservation. Demand for the reservations goes up. A company sets the price of its product at $10.00. No one wants the product, so the price is lowered to $9.00. Demand for the product increases at the new lower price point and the company begins to make money and a profit. The company could lower the price to $5.00 to increase demand even more, but the increase in the number of people buying the product would not make up money lost when the price point was lowered from $9.00 to $5.00. The company leaves the price set at $9.00 because that is the point at which supply and demand are in equilibrium. Raising the price would reduce demand and make the company less profitable, while lowering the price would not increase demand by enough to make up the money lost. These are examples of how the law of supply and demand works in the real world. "Supply and Demand Examples." YourDictionary, n.d. Web. 18 April 2019. <https://examples.yourdictionary.com/supply-and-demand-examples.html>.